The Sack Coat or Shell Jacket was the principal part of a soldier’s uniform. Other than a musket this should be your most expensive purchase. A great shell jacket advances your impression more than any other part of your uniform. Likewise a poor quality jacket will detract from your impression. A good Quality Shell Jacket can be purchased for between $125.00 and $150.00. Superior Quality Shell Jackets cost over $200.00. Initially, the Yell Rifles like many units raised in Arkansas were issued Frock Coats from the Little Rock Arsenal in Little Rock Arkansas. This Coat would have been the principal uniform of the Yell Rifles through March 1862. After Shiloh, the regiment was supplied from various depots east of the Mississippi. Over the months following Shiloh the unit would be issued primarily Columbus Depot Jackets. For Clothing all button holes and top stitching should be hand sewn. Because our impression is generally geared to mid war (1862-1863) this coat is not required. The Little Rock Arsenal Frock Coat may be purchased from Galla Rock Sutler in Russellville Arkansas. This is the only sutler I have found who makes this coat. If anyone else is aware of another please let me know. Our Primary Impression is mid-war. If you want to pursue this impression you should purchase a Columbus Depot Jacket. During the mid war period the Yell Rifles were with the Army of Tennessee and were issued this style of jacket. .
Columbus Depot Jacket The jacket is a 6-piece bodies, with 1-piece rather full sleeves tapering to the cuffs. The body pieces curve into a short rounded "tail" in the center of the back on most of the jackets. The jacket must be made of jean cloth. The collar and straight cuff trim about 2-1/2 inches wide of a medium or indigo blue kersey weave wool. The linings were made from a white or unbleached cotton tabby weave osnaburg. Two styles of the basic pattern have been identified. The "Type I," with interior pockets in the lining, and the "Type II," with one external pocket, set into the body of the jacket. There is no evidence that the type one pre dated the type two. Most likely these variations were the result of local manufacturers variations. See: CONFEDERATE "COLUMBUS DEPOT" JACKETS, The Material Evidence by Geoffrey R. Walden. After the fall of Atlanta, the Army of Tennessee was supplied from various Depots. Among the various jackets seen in the Army of Tennessee during the Nashville Campaign are the Atlanta Depot jacket and the Alabama Depot Jacket. 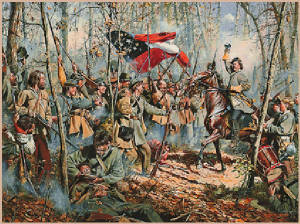 Following the Nashville campaign, the Army of Tennessee retreated into northern Alabama. The Army regrouped and refitted. Large numbers Alabama depot jackets were issued throughout the Army of Tennessee. These jackets were worn by the troops until they surrendered in North Carolina in April of 1865. Trousers may vary greatly within the unit from Confederate issue trousers to Captured Federal trousers. During the War soldiers went threw trousers faster than any other uniform item. Trousers were the most common issue to soldiers. You can purchase trousers for under $100.00 to close to $200.00. All visible stitching should be hand sewn. You will be required to obtain a pair of grey jean cloth trousers. Alternatively, you may use Federal Foot trousers, or civilian pattern trousers. We are not looking for a uniform look. Your jacket and trousers do not have to match. Next to the Shell Jacket, your hat is the most important part of your Uniform kit. Confederate soldiers hats varied widely from civilian style slouch hats to kepi or forage caps. Your hat should be constructed of proper materials with brim ribbon. No Hillbilly hats. Hats vary in price from $25.00 to well over $100.00. As with your shell jacket, the money you spend on your hat is well spent. A good hat purchased from Dirty Billy or a similar vendor, will cost a lot but it will hold up for many seasons. Early War May 1861 to Spring 1862 Early war troops were issued kepis. These caps were quickly discarded for civilian slouch hats which were more comfortable and functional. Mid War Spring of 1862 to Fall of 1863 The standard hat of all soldiers in the Army of Tennessee was a civilian style slouch hat. You will be required to purchase a civilian style slouch hat. The style is your choice as long as it is an appropriate period design. You may also opt for a kepi. Late War Fall of 1863 to End of War For late war impressions, the same hat used for the mid war impression are appropriate. The Shirt style varies greatly. Most soldiers in the Army of Tennessee wore civilian style shirts. Shirts can vary in price from $20.00 to $100.00. Braces(Suspenders) In the 19th Century trousers were worn across the belly button area. Men did not wear belts to hold their pants up. Instead they wore braces. Braces can be purchased from most of the sutlers for under $20.00. Shoes are one of your most important purchases. A good pair of shoes is a a soldier’s best friend. Alternatively a poorly made pair of shoes will hurt your feet, and fall apart in no time. Generally, most military shoes were made with lefts and rights. The soles were pegged or sewn using hand and machine stitching. Smoothness or roughness on the outside of the Brogan is optional. Shoe laces either string or raw-hide. You can also cut down your Brogans to a lower point for comfort just like a lot of the soldiers did. Socks: Socks must be period pattern cotton of wool. No modern socks should be worn. They may be purchased from various sutlers. Belts The men of the Yell Rifles wore a variety of belts. Roller buckle, Georgia frame buckle, fork tongue buckle or snake buckle belts are preferred. Captured Federal Oval plates are also appropriate. Oval CS should not be widely used within the unit. The Belt can be either black or russet color. Cartridge Box and Shoulder Strap The men of the Yell Rifles carried a variety of Cartridge Boxes. For a mid war impression you should stick with a Model 1855 .58 caliber cartridge box. You may use a Confederate Cartridge Box with a CS box plate or a Federal box with a US box plate. A CS Cartridge may be black or russet. If you carry an Enfield, you may opt for an Enfield Cartridge Box. Avoid Embossed US or CS Cartridge Boxes. These boxes were not used until late in the war. The shoulder strap should match the box. Your Cartridge box is worn on your right hip. The box is worn under your belt with the top of the box be even with your belt. Cap Box The cap box may be either russet of black. Avoid embossed cap boxes because they were not used until late in the war. Canteens Confederate Soldiers carried various types of canteens throughout the war. Your Canteen is worn on your left hip. The canteen should hang at about belt level. Your canteen should not hang down too low. Early War May 1861 to Spring 1862 Confederate tin drum canteens wooden canteens or Federal Model 1858 smooth side canteens are appropriate. All early war model canteens are also appropriate for mid or late war impressions. Mid War Spring 1862 to Fall 1863 Federal Model 1858 smooth side Model 1862 Bulls eye Canteens are appropriate. For Confederate impressions no cover with leather straps was very common. Haversacks Confederate soldiers carried a wide variety of haversacks throughout the war. You can carry a Federal Tarred Haversack, Confederate Issue linen or cotton Haversacks. Homemade bed ticking or carpet haversacks are also appropriate. The Haversack should be worn on your left hip. The top of the haversack should be even with your belt (Remember your belt is even with your belly button). Blanket: Confederate soldiers in the Army of Tennessee used a variety of blankets. Common blankets include the Issue Wool blankets, captured US Issued Blanket, Civilian Wool Blankets and Home made quilts. A blanket is an important purchase. Reproduction blankets can be purchased from various vendors for a reasonable price. Gum Blankets (Ground Cloths): Soldiers often carried rubber blankets or tarred ground cloths. Such an item was great pleasure to a soldier. It was used as a ground cloth to keep him dry, or as a poncho in rainy weather. A good quality reproduction ground cloth can be purchased from various sutlers for under $50.00. Shelter halves: While on campaign, soldiers did not carry tents. A luck soldier possessed a shelter half. When the army stopped for the night, two men could attach their shelter halves together and create a dog tent. The men could also string the shelter halves together or individually hang the shelter halves in the trees to create a shebang. Every member of the unit should obtain a shelter half. The shelter half should be made of Cotton drill and not canvas. The cotton drill is much thinner and easier to carry in your blanket roll or knapsack. The grommets should be sewn and not brass. Shelter halves may be purchased from the following makers. Firearms: Our primary impression is mid war. During the mid war period the 1/15th Arkansas was armed with Enfield rifles and Springfield rifles. You should purchase an 1853 Enfield rifled musket or a 1861 or 1862 Springfield rifled musket. Bayonet and Scabbard. Once you purchase your musket get a bayonet and scabbard. Before you purchase it make sure it matches your musket and that it fits. Bayonets are unique and sometimes require some work to get them to fit. If possible purchase your bayonet in person to assure proper fit. Tin Ware. Purchase a tin cup and a mucket. The cup’s use is obvious. The mucket is used for boiling rations or coffee. These items must be made of tin. No stainless steel. They can be purchased from any sutler.